The Seattle cat cafe could open by the end of October. The cat cafe trend is taking major metro areas in the U.S. by storm. After popping up across the West Coast and beyond in the past year, Seattle is set to be the next to debut a venue that's all about kitties + coffee. Seattle Meowtropolitan isn't open yet, but a recent hiring announcement shows it's getting close. Though the application process is now closed as of this Wednesday, positions advertised were for Feline Guardian (aka a cat lounge attendant), Coffee Alchemist (barista) and an assistant store manager. While its not known yet exactly where Seattle Meowtropolitan is to be located in the Emerald City, the rumor is in the Wallingford neighborhood (just west of the University District) and that it'll open before the end of the month. Owners of the cafe plan to fill it with adoptable cats, following in the footsteps of basically all other U.S. cat cafes. For those uninitiated to the concept, cat cafes originated in Japan and Taiwan, where cat ownership is often not allowed in city apartments, yet the population still seeks the mellow companionship cats offer. In the U.S., existing cafes offer the same concept. The public can simply grab a coffee or pastry and enjoy it in the company of friendly (or indifferent) felines. But should you have an instant connection with a furry friend, the option to adopt is possible, thanks to partnerships with adoption and rescue groups in the cafes' respective cities. And just to be clear, the health regulations of such establishments pairing food and animals are strict. As such, food or beverages are never served or prepared in an area where cats are allowed — visitors can eat or drink in the presence of cats at their own risk, depending on the business. 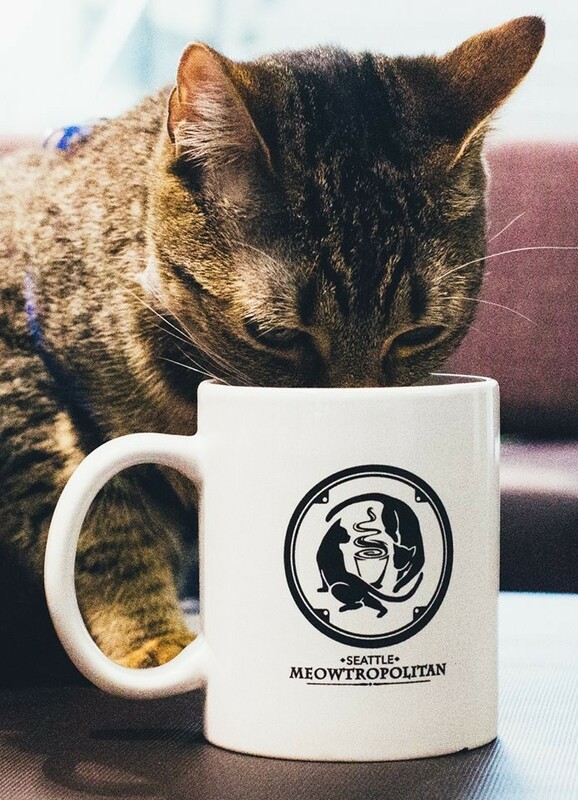 If all goes as planned, Seattle Meowtropolitan will become the second Pacific Northwest cat cafe to open this year, and ever. Portland's Purringtons Cat Lounge debuted at the beginning of this year, and so far the venue has helped find homes for nearly 100 cats through its partnership with Cat Adoption Team. Seattle could soon have a second cat cafe shortly after its first opens. The Seattle Kitty Kafe is rumored to be opening late this year or early next year. Elsewhere in America, the hipster capital of the South — Austin, Texas — is debuting its first cat cafe on Saturday. The Blue Cat Cafe takes on Austin's uber dog-friendly status (OK, it's actually a super animal-loving city in general) by debuting a space for cat lovers in East Austin. Next time you're in the Texas state capital, make sure to check it out. Here's some photos of the hip space, which was designed by Kate Benjamin, a cat expert and personality on Animal Planet. 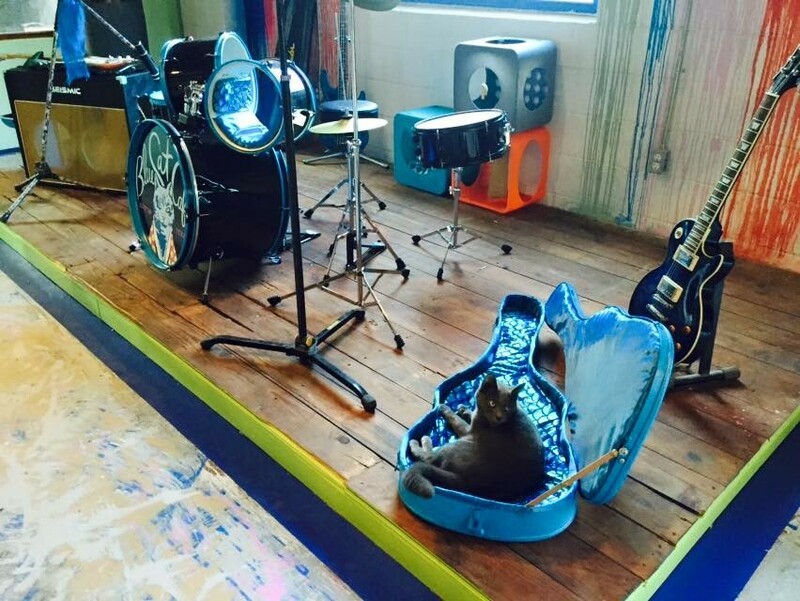 Blue Cat Cafe definitely pays homage to Austin's live music reputation with its furnishings and decor. Maybe the cats will have jam sessions at night? 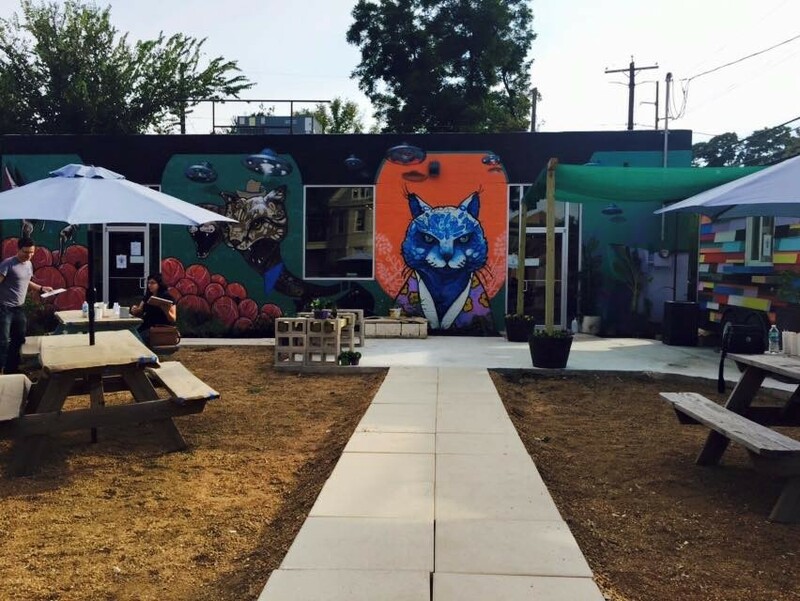 Bright murals cover the building, and a food truck on the patio keeps the food and cats separate.